Waste Management (WM)—guess what business they’re in?—did something yesterday that it hasn’t done in since February 2018, and has done only three times in the past decade: dropped more than 5% intraday. It was quite a move. The stock’s $5.38 decline was its biggest intraday dollar loss of the past five years, and it was more than six times the stock’s average daily move during that period. 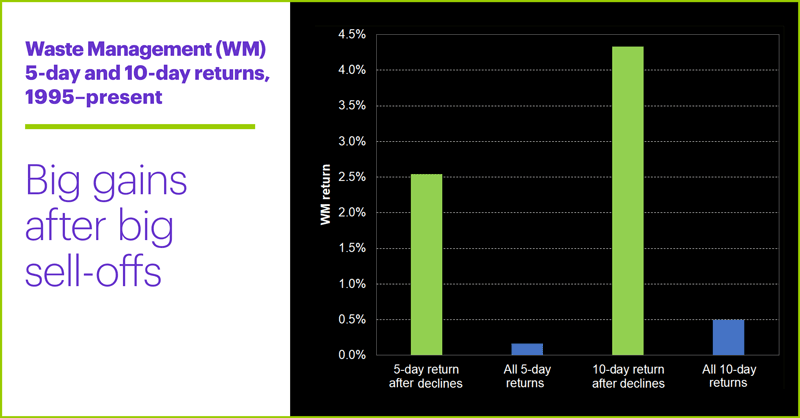 Down days in general—especially -5% ones—haven’t exactly been WM’s thing in recent months: The stock had a 17% year-to-date return on April 1 when it hit its most recent record high, was still up around 16% a day before yesterday’s flush-out, and had closed up 43 days this year while closing down only 26. Which may help explain why the market was caught off guard yesterday. Did this news merit such a big reaction? Impossible to say, since there’s no way to know if the analyst’s take on the industry will hold water over time, or if WM will weather any emerging challenges better or worse than other stocks in its industry. At least some traders thought yesterday’s initial WM sell-off was overdone—the proof is in the buying. But it’s worth noting that about halfway through yesterday’s trading session, WM had rallied nearly 3% off its intraday low of $97.55 to push back above $100, and was on target to close out the day in the top third of its range. One way to translate this bit of price action is that at least some traders thought yesterday’s initial sell-off was overdone—the proof is in the buying. But now, on to brass tacks. If WM’s past price moves are any indication—and they’re worth consulting, even if they’re not a foolproof indicator—bulls may have reason to expect at least some additional upside in WM, regardless of the longer-term picture. 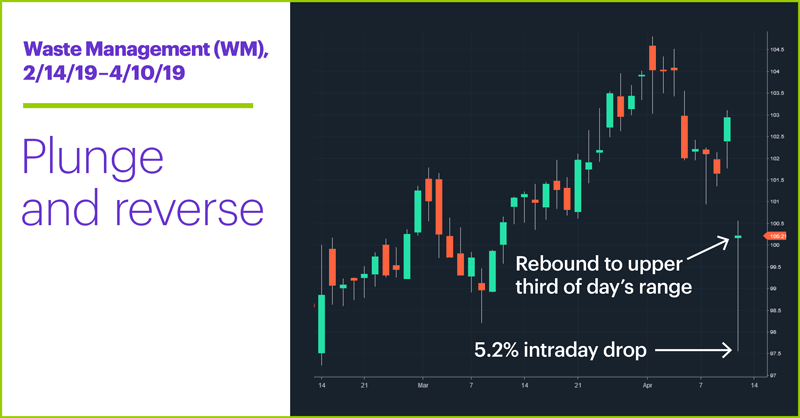 After the 21 other days since 1995 WM has closed in the upper third of its range after declining 5% or more intraday, the stock has shown a tendency to bounce back in the near-term. Will this turn out to be another time WM stages a near-term rebound from a downside shock? There are no guarantees, but traders with cool heads often look to market shocks for potential trading ideas, because as the WM data suggests, exceptionally big moves often get reversed, at least partially. Airlines had a big day yesterday, with Delta (DAL), American (AAL), United (UAL), and Southwest (LUV) all rallying more than 1% intraday. Today’s earnings include: JPMorgan Chase (JPM), Wells Fargo (WFC), PNC (PNC), First Republic Bank (FRC). 1 SeekingAlpha. Waste stock bull slashes ratings. 4/11/19. 2 Fool.com. 3 No-Brainer Stocks to Buy in...Business Services. 3/3/19. 3 The Economist. The gloom hanging over the world economy is confined to manufacturing. 4/4/19. 4 Supporting document available upon request. 5 Fairfield Current. Bank of New York Mellon Corp Boosts Stake in Yelp Inc (NYSE:YELP). 4/10/19.